In the book, entitled Hope for the World, Cardinal Burke argues that the “ferocious attack against life today” results from “the distortion of the sexual act by contraception”, [and homosexual acts and demonic “gender” twisting] and urges Catholics to defend human life. This entry was posted in Emanations from Penumbras, REVIEWS and tagged Card. Burke, pro-life. Bookmark the permalink. Translate: In order give access to sexual license with long term troublesome consequence. What does it say about our culture when the most mendacious of the species are willing to say what would be unthinkable until a few years ago? ISIS appears to have its rivals for the suppression of Christianity right here. I wonder if it was a Catholic doctor making the suggestion back in 1947/48 in Richland Center, Wisconsin? (I suppose the Burkes would have gone to a Catholic doctor if they could.) I have a friend whose mother was having a little trouble in the UK in the 1960s – but I wouldn’t, if she hadn’t insisted on knowing if she was pregnant, against the medical advice of an immediate d & c (and the nudge, nudge, wink, wink urging of the nun who was nursing her to go ahead without asking too many questions). Benedict Joseph asked, “What does it say about our culture when the most mendacious of the species are willing to say what would be unthinkable until a few years ago?” I’ve wondered something along this line, too, thinking by comparison how much caution Hitler realized he must exercise in ‘dealing with’ the Blessed Clemens August Graf von Galen. Cardinal Burke’s is the voice crying out in the wilderness, the voice of reason, caritas, and dialogue, now exiled. Venerator: I bought the kindle version (only $10!) 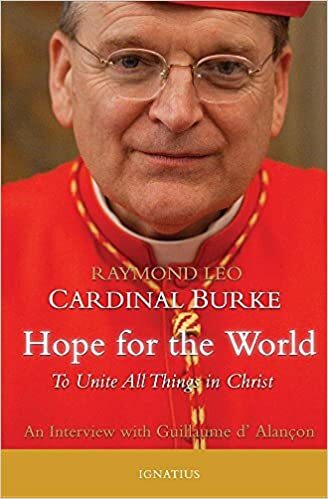 and 49% way through, Cardinal Burke explains that the doctor was not Catholic–but his mother had been hospitalized for several weeks at that point in the pregnancy. Excellent book so far! I am learning a lot about the trajectory of the post-Vatican Church and Cardinal Burke’s life. I got mine at Leaflet today. I was initially told they were out, but after whining about it, someone found a copy for me. Thank you for filling in that part of Cardinal Burke’s biography! Thanks for posting about Blessed Clemens August Graf von Galen. I just looked him up. Boy we sure could use a guy like him today!